Hey, guys! First of all if this is your first time reading a post here on Beauty and Beatitudes, welcome, I’m so glad you’re here! I have tons of posts that are going to help you with finding the best products for your beauty routines so stay awhile and use the search bar in the right sidebar to find anything you’re looking for! If you ever have questions please let me know, either in the comments on the post or you can always email me at hello@toreynoora.com. Today I’m super excited to share my new obsession with Skinny & Co. I was sent a couple of their products and fell in love instantly. I got the sugar scrub, a facial oil with lavender (heaven), and a lip balm. So if you know me and read B&B regularly I do like to use natural and organic products when I can. While I’m not exclusively natural/organic I do like to incorporate it a lot especially in skincare. Skinny & Co has a bunch of products and they’re all raw and natural. I will include my scrub demo video and don’t forget to watch my other new video here. 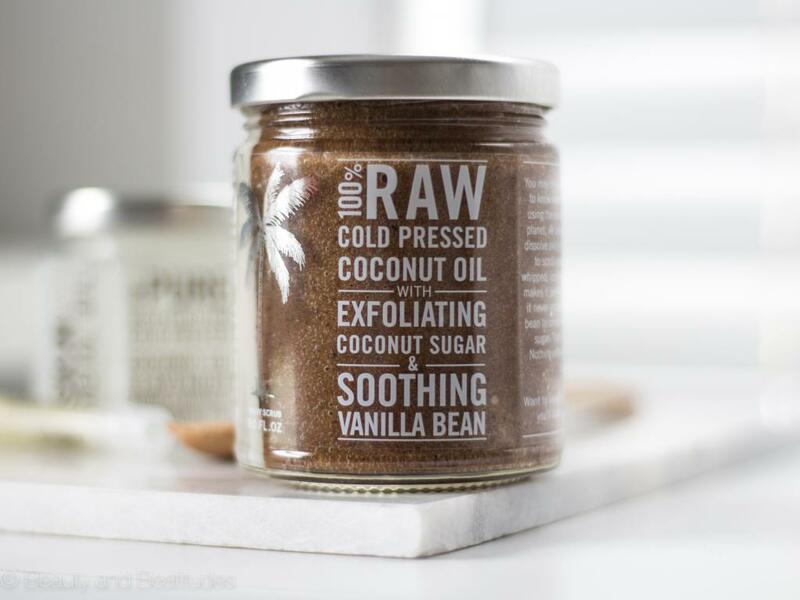 It has raw coconut oil, coconut sugar, and vanilla. It’s gentle and leaves your skin super smooth and hydrated. I love the way this leaves my skin. This oil has coconut oil, chamomile, lavender, and essential oils. As you can imagine it smells amazing and leaves my skin super hydrated. It also absorbs well and I don’t feel greasy afterwards, like after using other coconut oils. The lip balm is also perfect. It has coconut oil, bees wax, coco butter, peppermint, and vitamin e. You can feel good about putting this on your lips knowing the ingredients are raw and natural, that’s why I’m so obsessed with this brand already! I also love that I can share these products with my daughter not having to worry about chemicals or nasty ingredients. Thank you so much for reading today! How often do you use a scrub? I have a post here all about exfoliation. Thanks to Skinny & Co for collaborating with me on this post.